The trawl by Nimbus through the collection of Richard Itter’s broadcast tapes has spread its wings beyond the raft of releases on the Lyrita label to this vintage set of transfers from acetates deriving from BBC concerts during 1953-54 on the Cameo Classics imprint. It contains two recordings conducted by Sir Malcolm Sargent at London’s Royal Festival Hall, regarded in the 1950s as a model of acoustic excellence but later excoriated on account of its over-analytic effect and lack of resonance which has only finally been addressed in recent years. It seems however to have worked well as a recording venue in these BBC broadcasts, with results in terms of sound that surpass many studio tapings of the same period. And both of the recordings here have value in the fact that they preserve performances by major artists who did not otherwise set down their readings of the scores for posterity. 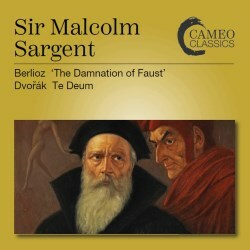 So far as I am aware, there are no other recordings of Berlioz’s Damnation sung in English in the current catalogues, and this set will therefore have an appeal beyond those who simply wish to hear Hammond and Lewis in two roles that might well have been written with their specific talents in mind. And then of course the many fans of Sir Malcolm will want to acquire any recordings of his period with the BBC. And finally, all of us should be grateful to the late Richard Itter for preserving these performances, and to the Nimbus acquisition of his archive which makes releases such as these possible.